It’s the type of photo-op you probably see on environment ministry or agency websites around the world, especially as World Environment Day (05 June) approaches. The Environment Minister, praising some company or group or individual for doing something deemed environmentally-friendly, often followed by a representative of the company touting the measure as a sign of their corporate social responsibility. 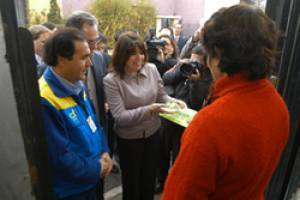 In this case, Chilean Environment Minister Uriarte is helping give recognition to a company for switching from regular plastic bags to biodegradable ones whose plastic has been treated so that it can (under certain conditions, but the press releases and speeches never mention that) degrade within two years. She even called for other companies to follow suit. Some of you are asking by now, so what’s wrong with that? Isn’t that commendable? Why the title for this post? A clue: the name of the company being praised is Chilectra. A power firm. You see, the plastic bags in question — such as the one in the hand of the praising Minister — wrap the monthly electric bills sent to customers. Does your electric bill come wrapped in plastic? Mine doesn’t, and never has no matter what state I have lived in. Didn’t in Santo Domingo either. Instead of praising Chilectra for switching from conventional plastic to biodegradable, why isn’t the Minister asking it to abandon the plastic wrap altogether? Why praise unnecessary and excess packaging, however biodegradable it might be? You might say, well, at least it’s biodegradable, instead of lasting hundreds of years as litter in the street or in the landfill as conventional, untreated plastic would. Regarding litter, if the bags were not used when not necessary in the first place, then no litter results. And being biodegradable simply means the bags will only blight the streets and drains and greenery for some two years — but still be litter in the meantime. In other words, the appreciable environmental benefit of this switch is minimal. Doubtless the public relations benefit for Chilectra is significant, having cameras document the Environment Minister handing out their electric bills and urging other companies to follow their example. But the tangible environmental benefit for Chile is marginal at best. If I was a new Environment Minister such as Ms. Uriarte, I’d like to think that I would have chosen the positive private initiative to praise near World Environment Day with greater care. La Ministra de Medio Ambiente, Ana Lya Uriarte, encabezó esta mañana el lanzamiento de una bolsa cien por ciento biodegradable, y con la cual la empresa Chilectra enviará las cuentas de energía a los más de un millón 400 mil clientes que atiende en la Región Metropolitana. Para la Secretaria de Estado, “se trata de una iniciativa que permitirá que las cuentas de la luz estén contenidas en una bolsa compuesta de un aditivo especial, que reducirá el tiempo de su degradación y biodegradación en tan solo 2 años, disminuyendo así el tiempo en que este material permanece acopiado en los rellenos sanitarios. Según la Ministra Uriarte, “nos parece que una campaña de este tipo, que es asumida por una empresa privada, merece sin duda alguna el apoyo de la autoridad. Esperamos, por lo demás, que sea replicada por otras compañías a lo largo del país”, afirmó la autoridad. De acuerdo a mediciones científicas, los plásticos convencionales, dependiendo de su espesor, pueden demorar entre 120 y 600 años en desintegrarse, causando un nocivo efecto al medio ambiente. Anualmente, en todo el mundo, circulan entre 500 mil millones y 1 billón de bolsas plásticas para diferentes usos, a un promedio de 150 bolsas por persona al año. Se estima que el 90% de las bolsas plásticas acaban su vida en un vertedero.